The LEAD FOOT SIDE KIT for the Ford truck F-150 2015 2016 2017 2018 and 2019 F-150 series. This Ford F150 vinyl graphics kit comes complete with both side stripes with LEAD FOOT HOOD Stripes also available that have been cut with care to fit the truck body and side kits of the 2019 Ford F-150 Side Stripe Decals perfectly and give it an instant rally racing makeover. These LEAD FOOT SIDE KITS Ford F-150 graphic packages for Ford truck F-series F-150 pickup have been precision cut from the finest quality Ford Truck decals and stickers to give you a perfect finish that will last. We don’t use cheap and nasty vinyl in our vinyl decals kits at Fast Car Decals. 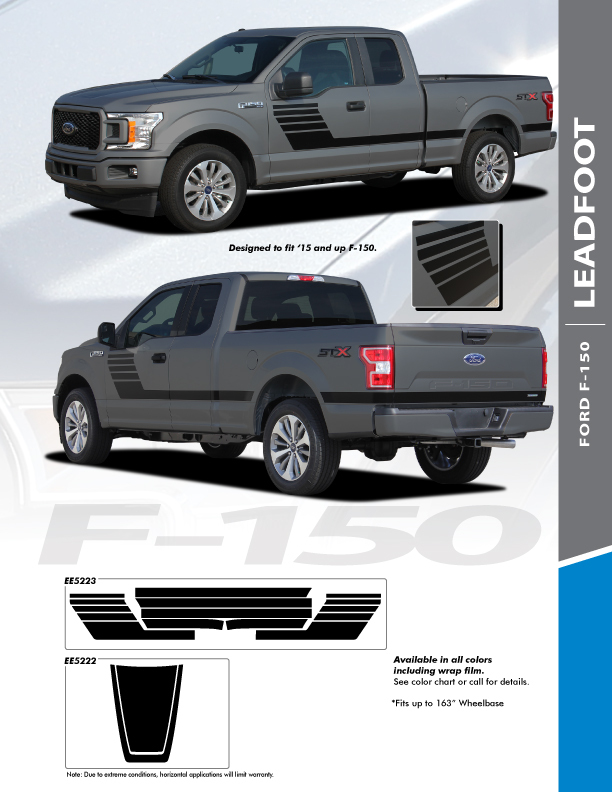 The F-150 LEAD FOOT SIDE KIT side body vinyl graphics and decals kit is designed and manufactured to the highest specification to ensure that you get a hassle free, straight out of the box! Fastcardecals.com! TEXT or Call Us Today!